These angel ornaments are heavenly! And if you are looking for Communion or Baptism angel favors these are perfect: they are beautiful, arrive attractively gift packaged and are value-priced. 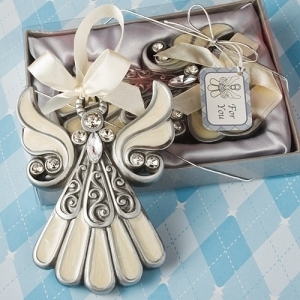 Each angel ornament is made of silver pewter colored poly resin and has a stunning ivory inlaid enamel design (wings and gown). They are then adorned with shimmering rhinestones. They have an attached ivory satin ribbon so that you can hang it anywhere or attach it to anything (backpacks and purses have been popular). They measure 4 1/2" long and 3" wide. It doesn't stop there! Each angel favor arrives nestled amid silver satin inside a textured silver gift box with a clear, showcase top. It is then finished and tied with a silver metallic elastic cord and has an attached angel design "For You" gift tag. Please allow up to 7 business days to full your order; then add ship time.